Photo: South Florida head coach Willie Taggart. Willie Taggart’s mind will be preoccupied finding a way for USF to steal a football victory from favored Michigan State when the Bulls' new head coach trots onto the field Saturday at Spartan Stadium. But along the way from Taggart's South Florida hiring on Dec. 9 to the September afternoon kickoff, he realized his new school is playing on a field considered hallowed ground in the integration of college football. Taggart understands the history of black athletes – including one such as Jimmy Raye, Sherman Lewis and Tyrone Willingham, who later went into coach. They were recruited to Michigan State by Duffy Daugherty, the Spartans’ color-blind College Football Hall of Fame coach. Taggart, 37, is one of only 15 black head coaches in the Football Bowl Subdivision (formerly Division I-A). He is young enough that he wasn't yet born when Bubba Smith, George Webster and Gene Washington arrived in the mid-1960s from segregated high schools in the South to play for the Spartans along with Raye as pioneer black quarterback. But he is aware of the paths they cleared as they led Michigan State to back-to-back unbeaten Big Ten championships and national titles in 1965 (UPI) and 1966 (National Football Foundation MacArthur Bowl). "As I grew in my career, I appreciated more the guys who came before me and how hard they worked to open doors," Taggart said. "You learn to appreciate the example and the foundation they set for those of us who have followed them. "It's just like the history of our country - Dr. Martin Luther King set a foundation with a dream and then he expected the rest of us to build on it. It's not any different with us in coaching. We all have to look together at one symbol as the American dream." Taggart’s lifetime, despite his relative youthful age, is not that far removed from the end of segregation. He was born in August, 1976 in Bradenton, Fla., just five years after Alabama coach Bear Bryant finally fielded his first integrated varsity in 1971 with just two black players. The last segregated SEC schools held out until 1972: Georgia (three black players, Mississippi (one) and LSU (one). Smith, Webster and Washington were Michigan State's two-time All-American players later enshrined in the College Football Hall of Fame, but in addition to Raye breaking ground as a black quarterback, his ongoing legacy to Michigan State and integration have been the coaching trails he blazed in in a college and NFL. His coaching career spans five decades, most recently as a senior offensive assistant with the Tampa Bay Bay Buccaneers. Taggart and Raye struck up a friendship a decade ago when Raye was coaching with the New York Jets in 2003 and one Taggart's former players, Jason Michael, was with the Jets. Michael, who is now an assistant coach with the San Diego Chargers, had led Western Kentucky, to the 2002 NCAA Division I-AA (now the Football Championship Subdivision) title. Raye, from Fayetteville, N.C., was one of college football’s first black assistant coaches when he joined Daugherty’s staff in 1971. When Raye moved to the NFL with the San Francisco 49ers in 1977, there were only three other black assistant coaches throughout the then-30-team NFL. In 1983, the Los Angeles Rams head coach John Robinson hired Raye as one of the NFL’s first black offensive coordinators. Two other trailblazing Michigan State that go their starts playing and coaching on hallowed Spartan Stadium turf are Sherman Lewis and Tyrone Willingham. Lewis, from Louisville, Ken., finished third in the 1963 Heisman Trophy voting as an All-American halfback. He joined Daugherty's staff in 1969 and was a mentor to Raye when they worked together under Daugherty. Lewis eventually followed Raye on an NFL path, claiming a jewelry box of Super Bowl rings with three as a San Francisco 49ers assistant and one with the Green Bay Packers. He was an offensive coordinator with the Packers under Mike Holmgren. Raye recruited Willingham to Michigan State as a walk-on athlete from Jacksonville, N.C. Raye and Lewis were both mentors to Willingham. Lewis and Raye never received an opportunity as a head coach, but Willingham cracked that ceiling with Stanford (1995-2001), Notre Dame (2002-06) and Washington (2005-08). Willingham was the first black coach to win an NCAA Division I-A bowl game when Stanford embarrassed a Michigan State team coached by Nick Saban in the 1996 Sun Bowl, 38-0. Next, Willingham was the first black coach to take a team to the Rose Bowl when Stanford won the 1990 Pac-10 title. He continued shattering ceilings as Notre Dame's first black head coach in any sport when the Irish hired him in 2002. "Jimmy Raye and those guys worked hard to overcome a lot - and not just in football," Taggart said. "They worked hard to prove it could be done and they had to work a lot harder to do it then than we do now." Taggart played quarterback at Western Kentucky from 1994-98 before entering coaching. He was a WKU assistant from 1999 to 2006 and then at Stanford from 2007 to 2009 under Jim Harbaugh. Taggart's alma mater brought him home as a head coach from 2010 to 2012 - an opportunity Michigan State failed to bestow upon Lewis, Raye and Willingham. "Western Kentucky is special to me," Taggart said. "They gave me a scholarship and I grew into a young man. They helped me with my career and an opportunity to come back as head coach to lead the way. It was great that they put that trust in my hand. They realized how much Western meant to me and how much I meant to Western. I will always be a Hilltopper and owe to the university to give back. It was very hard for me to leave Western, but you have goals and things you want." Overall improved opportunity is a message Taggart frequently impresses upon his players as history unfolds and America inevitably takes one step back with every two steps forward in race relations. That has been especially poignant this summer in the 50th anniversary of Martin Luther King Jr.'s "I Have a Dream" speech at the foot of the Lincoln Memorial. 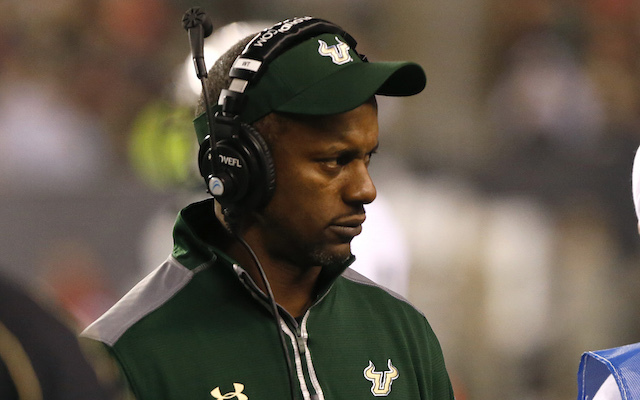 "I tell our guys don't sit back and think we have it bad," Taggart said. "There are a lot of people who had it worse. We've got it easy - there is no reason to sit around and complain. We owe it to those who came before us to appreciate them and respect them. I wouldn't be here in this job if wasn't for guys like Jimmy Raye, Sherman Lewis and Tyrone Willingham. They showed us how we can do it."